Rome is located on the peninsula of Italy. Romes roads were superbly built giving the circumstances. They had no compasses to help them build them just tools they invented. They have lasted centeries . 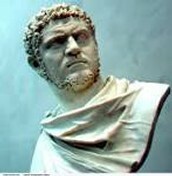 Emperor Agustus . The baths of Caracalla AKA Thermae Antoninianae were built under the command of Emperor Caracalla for popularity . It was a big bath house for the public . Back then there would be a bath house every 5 blocks ,. Where the Christaians burried their dead.